I probably am one of the most disorganised people ever..but that doesn't stop me from loving organisational ideas! 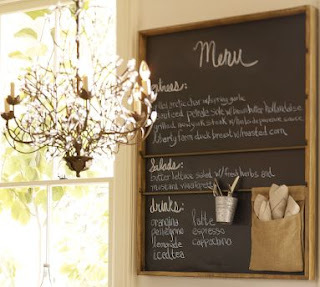 I think these ideas from 'Pottery Barn' via Cafe Cartonlina are great, especially the mini white boards. 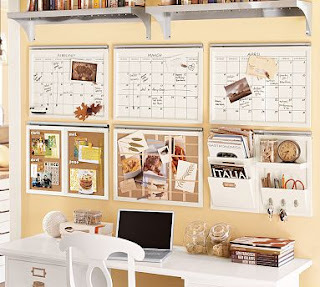 I really hope me and Thomas get this house and I can have my own little craft room! Oh I'm the same way. I will never live in that perfect showroom house, but I will never stop dreaming about it either. I love the bulletin board with the envelope markings. 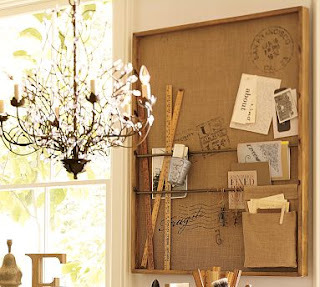 I've been looking for something creative to do with a bulletin board I bought for my craft room.